I may not wear much makeup, but I take extreme pride in two things -- my lashes and my skin. I never walk out of the house without making sure they both look their absolute best. So the Origins #ZingCare Prize Pack seems to have been created just for me! I've long been a fan of everything Origins, and the two products in this pack are no exception. Origins GinZing Brightening Mascara To Lengthen & Lift: This mascara contains natural plant extracts that work to deliver length, volume and definition to your lashes. But that's not all -- it also contains an Energizing Treatment Complex (with the inclusion of Ginseng) to help your lashes remain full and lush, an Eye-Brightening Pearl Complex that saturates lashes to make your eyes appear whiter, and a blend of Vitamins E and B to condition the lashes. Origins GinZing Energy-Boosting Moisturizer: Bring back hydration and moisture to the skin with this moisturizer, formulated with a host of ingredients to really nourish and balance the skin. Panax Ginseng eliminates signs of fatigue, caffeine and grapefruit oil keep the skin from becoming irritated, olive brings a glow to the skin and spearmint oil encourages energy. This moisturizer sure packs quite a punch! And here's the best part. One lucky winner will receive this prize pack today, with a retail value of $45. To enter, use the Rafflecopter widget below. Good luck! This giveaway ends on Monday, August 5 at midnight. One winner will be chosen AT RANDOM on Tuesday, August 6. Multiple entries will be disqualified. Giveaway is open to US residents only. Loveeee this - I'd be ecstatic to try out more from the Origins brand. You're such a sweetheart posting great giveaways. Thanks Jaime. Hope to win these goodies. add a few drops of organic jojoba oil to your moisturizers when you skin is very dry! Always, always, ALWAYS wash your face & moisturize before going to bed! My top skincare tip would be to drink lots of water and nourish the skin from within! Throw a little (just a little) baby oil on right before getting out of the shower. Skin feels and looks great! What a great combination. 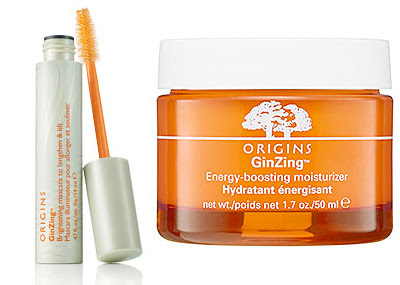 I love Origins products! My top skincare tip: wash your makeup off every night! No excuses. Always wear a moisturizer with a SPF of at least 15. If you don't like the smell of sunscreen, buy moisturizers with sunscreen that's for sensitive skin. No scent at all! My fave is Oil of Olay for sensitive skin with SPF 15. My Skincare Tip is to ALWAYS use a toner made for your skin type/needs after washing/cleansing your face because it will bring back balance to the PH Levels in your skin. My skincare tip is always use lotion or foundation with spf. Be gentle with your skin! Nothing replaces good sleep, so get some for better skin! always use sunscreen when out in the sun. My best tip is to stay hydrated. I try to drink 8 glasses of water a day and eat foods that contain a lot of water, like fruits and vegetables. My Skincare Tip is Not to Overcleanse to prevent excessive dryness or oil secretion. Even If You Have Oily Skin.....ALWAYS Moisturize! My tip is to moisturize damp skin to help retain moisture. I love Origins products. I haven't tried this yet but would love to. Always use sunscreen and drink lots of water. Warm up your mascara a little before applying by rubbing the bottle between your hands for a minute. Helps prevent clumps and it goes on smoothly! My tip is to use anti-aging cream not only on your face but neck too. Always make sure you moisturize throughout the day. To wash your face every night no matter how tired you are!! My best skincare tip is to always remove makeup and wash your face before going to bed.